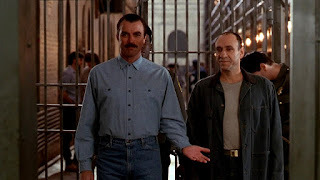 A prison and revenge drama, An Innocent Man features some harrowing life-behind-bars scenes, but is otherwise clunky and poorly written. In Long Beach, California, Jimmie Rainwood (Tom Selleck) is a respected aircraft maintenance crew chief, happily married to Kate (Laila Robins). Undercover narcotics detectives Mike Parnell (David Rasche) and Danny Scalise (Richard Young) are celebrated for their frequent drug busts, but in reality are corrupt officers not beyond planting evidence and profiting by skimming from the drugs they seize. Acting on a muddled tip from a drug dealer, Mike and Danny mistakenly invade Jimmie's house, a bungled operation that ends with Jimmie shot and wounded. To cover up their blunder, the officers plant a gun and drugs in Jimmie's house. He is falsely charged and convicted for shooting at the officers and dealing in narcotics, and sent to prison for six years. Jimmie finds life behind bars tough to handle, and he is threatened by competing black and white supremacist gangs. 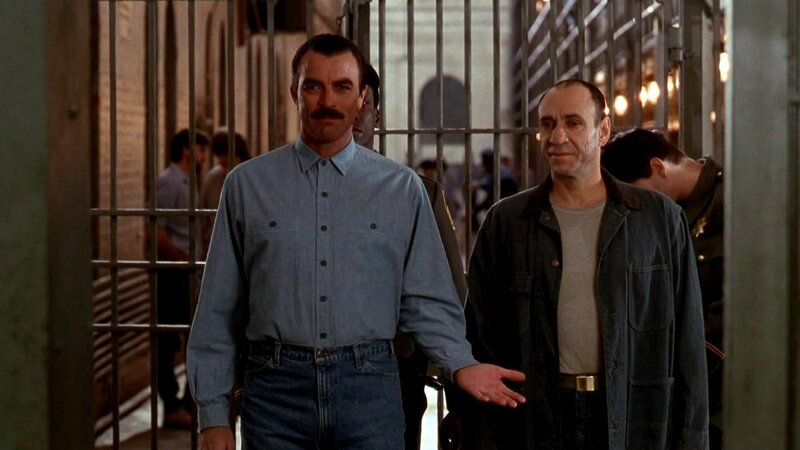 He finally turns to long-term convict Virgil (F. Murray Abraham) for help. With Virgil's guidance Jimmie learns what it means to toughen up to survive. Once released on parole, he will have to decide how to seek revenge on the men who ruined his life. About half of An Innocent Man is set in prison, and the film is at its best in portraying life in hell for a wrongly convicted man. Director Peter Yates gets into his stride, and creates for Jimmie the stickiest of dilemmas. He has to accept either humiliation or violence, choices that are equally abhorrent for a decent and well-respected middle class family man. The script by Larry Brothers creates a prison ecosystem where racial divides are alive and thriving, the inmates make and enforce jungle rules, the prison guards are next to useless, and men like Jimmie can choose a side, prove their brutality, or get badly hurt. The relationship between Jimmie and Virgil is forged in captivity, and should have been the highlight of the film. But the limits of the script are exposed, and what could have been a friendship born out of hardship is glossed upon in a few mediocre scenes. The character of Virgil is rich with possibilities that remain unexplored, with F. Murray Abraham underutilized. If the scenes in prison are at least interesting if not completely fulfilling, the film falls apart outside the walls of confinement. The opening act is listless and features one of the worst attempts at courtroom drama put to film. From a drug dealer testimony being accepted at face value to the planted gun not receiving any scrutiny, the case against Jimmie Rainwood would and should have been torn to shreds by any competent lawyer, but here there is a rush to convict that serves the plot but is simply ridiculous. Worse still is the final act, with the revenge theme kicking in and an ill-conceived and convoluted plot being hatched that ends with a wild shoot-out in a failed attempt to satisfy fans of mindless action. 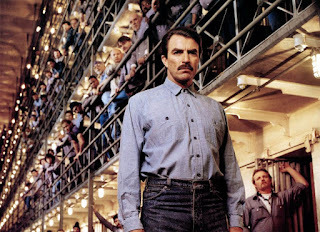 Tom Selleck doesn't do much to prove that he had any big-screen potential, and pales in the few scenes next to Abraham. In the supporting cast David Rasche makes for an entertaining late 1980s villain, hamming it up as a charismatic but near-psychotic corrupt cop who believes his own invincibility hype. While not a total loss, An Innocent Man is guilty of a piddling performance while on parole.